Looking for a complete I.T. solution? Security is paramount to any business using technology. Sharpe Secure Suite is designed to give you ultimate protection for your devices. This package combines all the products you need to keep your business safe and running smoothly. Our solution includes the industry leading ESET security software, which over the last decade has ranked number one for stopping viruses in the wild. The software uses very little computer resources, therefore not slowing down your systems. With features such as live updates for virus definition databases, remote deployment tools and remote administration, it is the right choice for any size business. We have implemented this software from small businesses to multi-nationals with 18,000 users. The main advantage of this suite is that we are here to help with your problems. If you have a virus related issue then we will make sure you are top of our list when it comes to support as we understand the impact that viruses can have within businesses. There are many threats that don't fall under the Virus category, that's why anti-malware is added to the package to provide excellent protection against threats like spyware and adware. Malware attacks can stop access to the internet causing distribution and gathering of sensitive information for the purpose of gaining access to private business information. Our Sharpe Secure Suite has been design to fully protect your computer but we would also recommend protecting your network. Network security firewalls are designed to stop hackers entering your network, also stopping malicious attacks and are a great tool for preventing cyber crime. 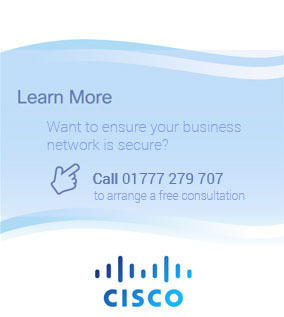 We are partners with the industry leading hardware security manufacturers, Cisco Systems, who specialise in products for larger businesses, and DrayTek, who specialise in products for smaller businesses.